Guys, I had a really great weekend that was made even better by this delicious vanilla almond birthday cake. It is a triple layer cake. Did you hear that? TRIPLE LAYER!! I think I have died and gone to heaven. But let me rewind for a second. My mom's birthday was on Saturday and to celebrate, she and my dad were coming down to NYC for the day. We didn't have much planned but I wanted to make her a cake and I found the perfect inspiration from one of my favorite food bloggers, My Name is Yeh. All week I was planning out how I was going to make this cake: bake the cake on Friday night and then wake up early on Saturday to make the frosting and decorate so it was fresh before my parents arrived. I literally planned every minute I would be spending after work on Friday. Then, my parents let me know that they wanted to see a Broadway matinee show on Saturday. More planning! How was I going to do this? Should I go to the TKTS booth on my lunch break to try to score some cheap tickets? I was super stressed. Luckily my friend, Kelly, came to the rescue and told me about an app (called Today Tix) where you can browse show tickets for the week and purchase them on the app. It was a miracle! Thank you Kelly! I bought four tickets to The Curious Incident of the Dog in the Nighttime and felt like all my problems were solved. Now, back to the cake. If you can't tell, I am really into this cake. It was so fun to make because the almond flavoring smelled delicious in the oven and the multi-layers made me feel like I was constructing something very important. 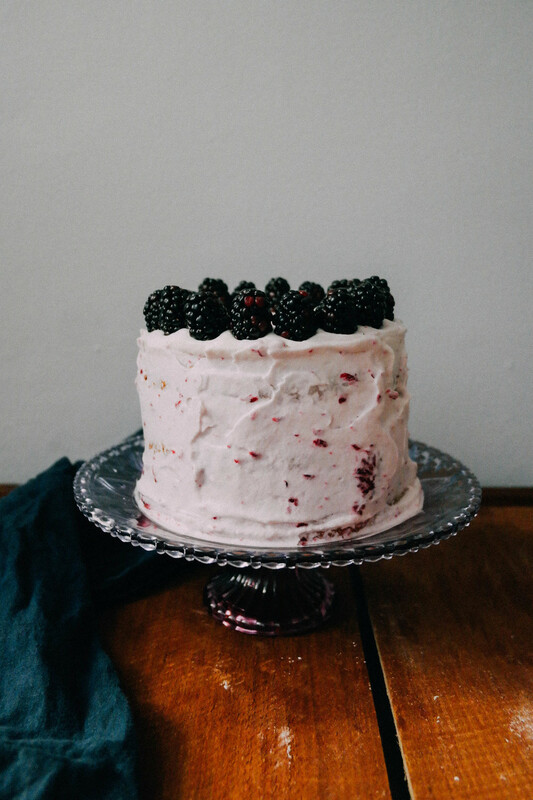 The cakes were super moist and dense and to add some fruitiness, I cooked up some fresh blackberries into a jam-like consistency and added it to the whipped cream frosting. It was perfect! I also enjoyed using my cake decorating skills (LOL) from my four years working at the local Ben & Jerry's during high school. Needless to say it was delicious and I can't wait to play with more cake recipes! The overall weekend with my parents was wonderful as well! Before the play we had brunch at a French restaurant in my neighborhood where I had a brûlée grapefruit (I am now determined to buy a torch so I can do it myself) and grits with feta, eggplant and a poached egg. Yum. Pat and my dad ordered a crispy chicken sandwich, which turned out to be a massive fried chicken sandwich! It was so big. Afterwards we headed over to Times Square, my least fave part of the city, and pushed our way through the crowds to get to the show. I am embarrassed to say that I haven't been to a Broadway play since moving here (I have been to them in life, though, FYI) and I absolutely loved The Curious Incident of the Dog in the Nighttime. The acting was amazing and I was in awe over the cool set. I recommend that anyone see this show, and I've decided that I should take advantage of going to more Broadway plays. I hope everyone has a great Monday! Preheat oven to 350ºf. You'll need three 6-inch cake pans, sprayed with coconut oil. With mixer, beat almond paste and egg yolks until well blended in a large bowl. Add in vanilla and almond extract and mix. Set aside. In another large bowl, beat the egg whites and salt with a mixer until peaks form. In parts, beat in sugar and continue to mix until stiff peaks form. Fold the whites into the yolk mixture. After mixed, gradually fold in the flour mixture. Pour batter into prepared pans as evenly as possible. Bake for about 20 - 25 minutes or until a knife or toothpick comes out clean. Let the cakes cool. In a sauce pan, heat blackberries, sugar, water, and lemon juice on low until it comes to a steady boil. Using fork, crush blackberries and continue stirring. Cook for about 20 minutes and let cool. You can strain the blackberries if you want for a more even mixture (I didn't) or keep as is. 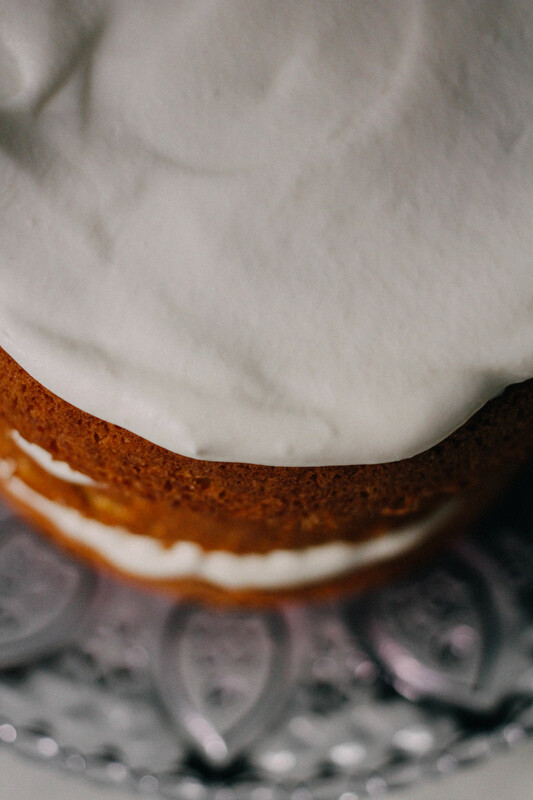 For the frosting, whip up the heavy cream to soft peaks. Gradually beat in the powdered sugar and almond extract, and continue whipping to stiff peaks. Once the blackberry "jam" has cooled, fold it into the whipped cream mixture and decorate as you wish!